Summer is here! Dogs love summer and they love fun and adventure with you. But, they also depend on you to keep them safe. Before you head out on your next adventure read up to understand how to keep your furry pal safe while out and about. 1. Dogs prefer the shade. In the wild, coyotes and wolves hunt in the early morning or late evening to avoid the hottest part of the day. 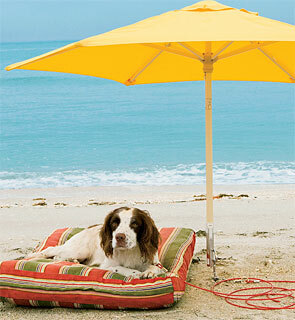 Although your pet loves to run and play when you do try and respect the fact they also need to relax in a shaded area. Even if they are playing in the water, when resting find a tree they can lie under. Please don’t ever chain your dog up in the sun. In many states it is against the law and it is cruel. 2. There is no pavement in the wild and your dog is not use to walking on it. 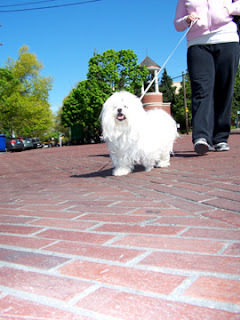 Your pet walking on hot pavement is like you standing on hot coals. Dogs don’t make good firewalkers. If you do need to be on the hot pavement consider investing in dog boots. There are many styles and colors on the market and they are easy to find online. Try and walk your pets in the early morning or late evening and use sidewalks and grassy parks. 3. Small dogs and dogs that sit low to the ground can get overheated very easily if you are walking on pavement. Remember their little bodies are close to the ground, so they absorb the heat coming off the street. It’s best to walk these little ones in a park. 4. A lot of dogs love water. 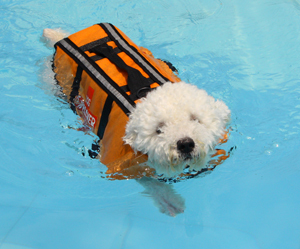 To be safe always have them wear a life vest when swimming. Even an avid swimmer can panic in the water and get into trouble. There are a few good life vests on the market. Get one that has an extra wide belly strap and handle on the top. That way if your dog does get into trouble you can lift them out of the water by the handle. 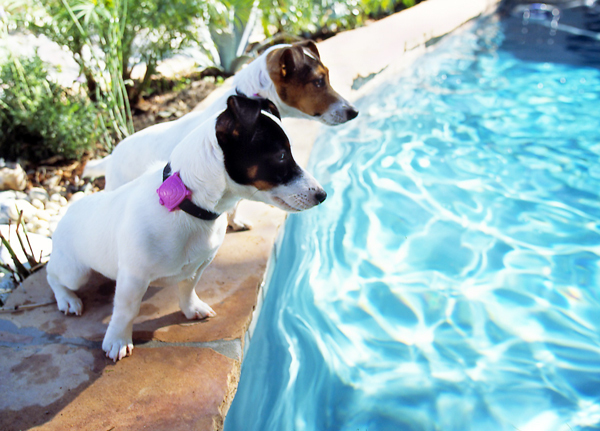 Certain breeds with shorter legs and wider bodies tend to roll in the water. Always, always watch your dog whenever they are in or near water. 5. Dogs love being out in the wilderness. It brings them back to their roots, but most suburban dogs have no idea how to survive by themselves. Always keep a close eye on your pet. 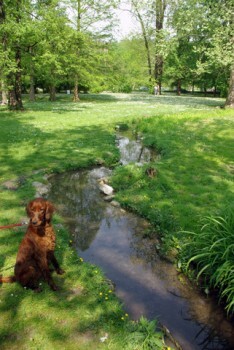 Most state parks require leashes because they don’t want your furry friend disturbing the wild life. If your pet is allowed to run off lead know where they are and what they are getting into. You certainly don’t want your pup making friends with a rattlesnake, porcupine or skunk. 6. Heat exhaustion is a very real threat to any dog. Their bodies don’t handle heat the same ways ours do. Dogs don’t sweat like humans, they pant to cool down. They only have sweat glands on the pads of their paws. Remember in the wild dogs snooze during the hottest part of the day. When walking or hiking with your dog stay in shaded areas as much as possible and carry plenty of water for the both of you. 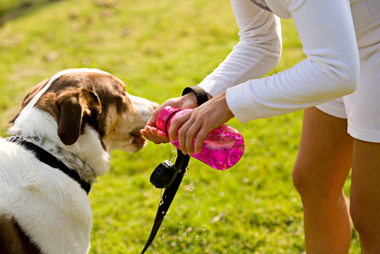 Let them drink as much as they need and also wet their heads and flanks to help them cool down. Don’t ever run with your dog if the outside temperature is above seventy-five degrees. 7. 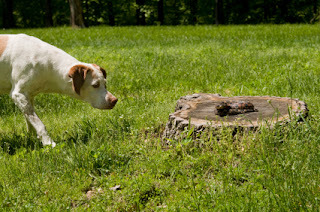 Ticks are a nuisance to you and your dog. They can cause many illnesses including Lyme disease. If you walk your dog in wooded areas a good rule of thumb is to give them a good brush out when you get home. Check both you and your pet for these pesky creatures. If one gets embedded in you or your pet, remove it by wetting a tissue with alcohol and turn counter clockwise as you are pulling the tick out. Alcohol makes the tick withdraw. Turning counter clockwise helps you remove the entire tick without leaving the head embedded. 8. 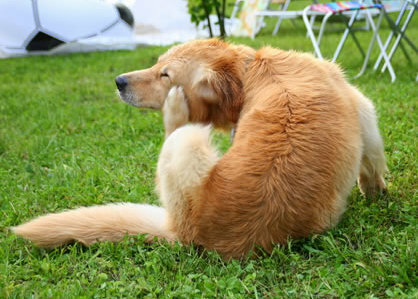 There are other creatures that can spread illness to your pet, depending on where you live. Watch out for rabies, west nile virus, snake bites, bee stings and even allergies. Check with a vet in your area to determine which diseases you need to be aware of. 9. Don’t ever leave your dog in the car on a hot day! Within ten minutes it can be thirty-five degrees hotter inside your car than the outside temperature. 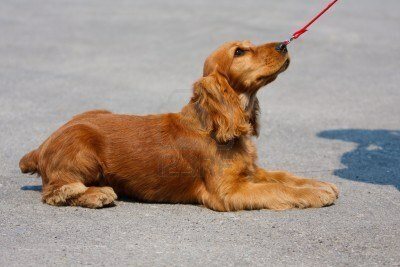 Dog can quickly be overcome by the heat, leading to heatstroke. Try and have one person stay in the car with the air running if you must pop into a store on the way to your outing. 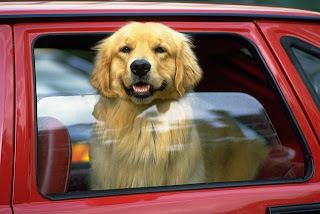 In some states it is illegal to leave your pet in the car. 10. Dogs don’t do well surfing around the bed of your pickup either. Let them ride up front with you. 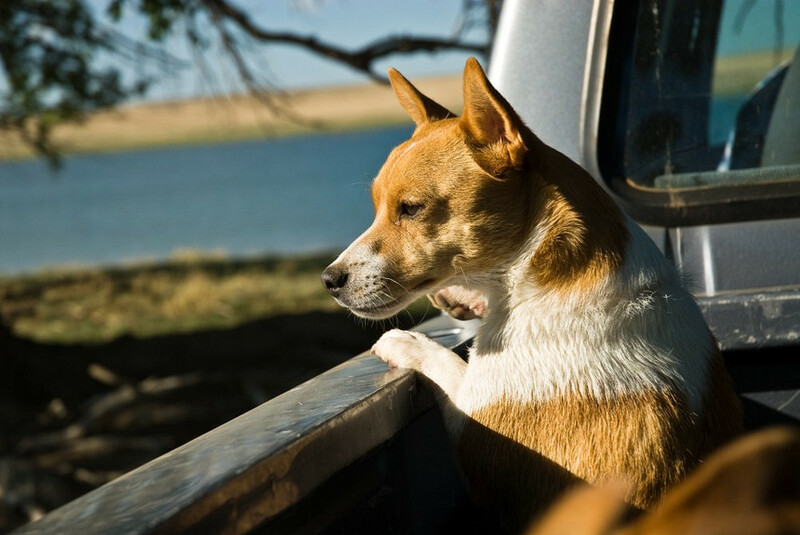 There are many dangers to letting your dog ride in the back of your truck. 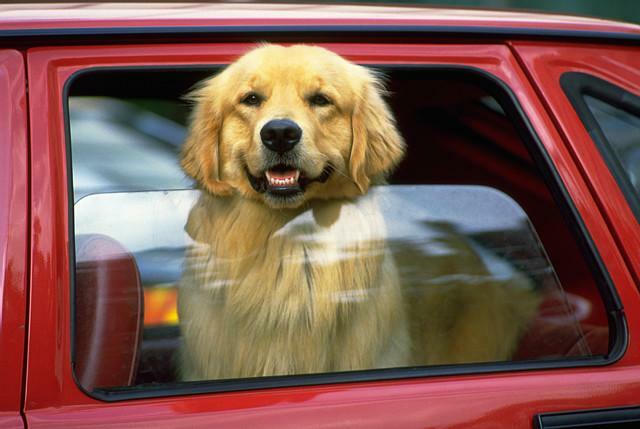 The sun beating down on your dog even at sixty miles per hour can cause heat stroke. Flying debris is very common on highways. Things can ricochet off the road and hit your pup. If they are tethered they can get tangled in their leads and strangle themselves. Dogs don’t have opposing thumbs which means it’s much easier for them to slide and fall. They may not be able to regain their footing and they can get injured bouncing around. You never know what may make a dog want to jump out of the bed of a truck, but I’ve seen it happen too many times. Even after the dog owner swore their dog would never do that. You want this to be a fun trip. Please let them ride up front in comfort, like you. Dogs do love summer and they love having fun with you, but please keep them safe. Remember a safe trip is a fun trip.